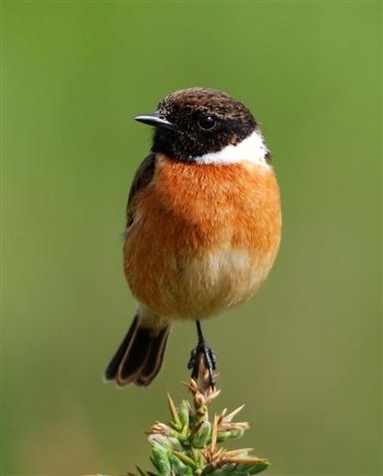 Male Stonechats are striking robin-sized birds with black heads, white around the side of their neck, orange-red breasts and a mottled brown back, as shown in Dennis Morrison's photograph. Females lack the male's black head, but have brown backs and an orange tinge to their chests. Birds are frequently seen flicking their wings while perched, often doing so on the tops of low bushes. As its name suggests, birds utter a sharp loud call that sound like two stones being tapped together. Their Gaelic name, clacharan, is appropriate. These are not one of your skulking species of bird. On Arran they are found in coastal scrub often gorse and also inland on heather-clad hillsides. Thick cover is required for nesting along with suitable perches from which to sing, display or use as a look out. On Arran, the Stonechat is a resident breeder and a migrant. While some birds occupy their territories all year, both inland and on the coast, others leave Arran to spend the winter in southern Europe or North Africa. For example a bird ringed in May in Ayrshire was recovered in Spain in December. In Scotland, Stonechat is at the northern limit of its European range and the influence of weather on its population and distribution is well documented. Following severe winters the resident populations of Stonechat can be practically wiped out. This seems to be the case on Arran after the last two cold winters, when the number of birds being reported on Arran reduced dramatically. However the species is a prolific breeder. The breeding season is prolonged from April to July. Resident pairs are frequently triple brooded and migrants double brooded. From the residual population it is anticipated that the species will re-establish itself, particularly if there is now a series of mild winters.